This is the Marvel movie I’ve been waiting for. I don’t mean to say that there hasn’t yet been a Marvel film that has been good, especially with the two recent X-Men films, The Avengers and more. While these movies have been good– or at least entertaining–, they always felt like movies and not like the living, breathing comic book pages I feel that many of them try to be. Sure, we have Sin City (and its sequel to look forward to this year, but neither are Marvel) and even Ang Lee’s Hulk (which did a really shoddy job at this), but Guardians of the Galaxy feels like a modern comic book, fully coloured, with every scene looking like a drawn panel you could easily imagine on paper. The camera angles, the cinematography, the beautiful worlds created, everything, contributed to this thrilling sensation. Every action shot could be followed. Every background felt real and possible within the dark skies above. I won’t say that Guardians of the Galaxy is the best Marvel film yet, but it is one that has shown possibilities for future comic book films, and for that alone it deserves your time. The mixture of humor, drama and action is usually well done within this film. However, it doesn’t always work. What could have been an enticing climax gets turned into an elementary school hall pass: A quick escape from a beneficial experience that deserved more time devoted to it. With that and an embarrassingly awkward moment just before the credits (which, luckily, had nothing to do with the story, so nothing was ruined), there were, indeed, moments that didn’t work. For the most part, the twist of styles actually worked, however. With enough crude humor to make this not a film of filth but a film that doesn’t give a damn, Guardians of the Galaxy feels unstoppable. With action sequences that are actually really well thought out, we can get behind these heros no matter how ill mannered or goofy they are. Who are these characters? Heros, villains and all in between; There was some stellar acting from this cast. Chris Pratt played the lead Star-Lord (or Peter Quill) with enough smugness to make him come off as someone unlikely to lead. However, it is his serious moments– fights included– that show us that Quill is just someone who has had to make things more enjoyable for himself to overcome his past. It doesn’t justify his ego, but Pratt makes Star-Lord an excellent lead character within this gang of misfits. Zoe Saldana may be only proving her typical casting choice works, but she pulls off the alien femme fatale Gamora pretty efficiently. She can cast a mean snarl, send a lashing glare and performs a fighting stance that could intimidate anyone. The odd couple Rocket and Groot (played by Bradley Cooper and Vin Diesel respectively) are hilarious, addicting and well casted. Cooper turns this anthropomorphic raccoon into a cynical reject that will back out of nothing. Diesel makes the repeated line “I am Groot” speak many words through emotions alone. The two of them prove they have a bit of a gift with voice acting. Dave Bautista is the newest to acting in this team, as he is a WWE wrestler, but he tries with all of his might and gives off a fun and likable performance as the dopey-yet-scary giant Drax. While that rounds up the Guardians themselves, and there are a number of great performances even in the smallest roles (Glenn Close, John C Reilly and Benicio del Toro sign the scenes they are in with a golden pen, and Djimon Honsou and Karen Gillian are great too), the greatest performance here is by the chameleon actor himself Lee Pace as the main villain Ronan. Make up aside, he is still almost completely unrecognizable. With a booming voice, the coldest stare, the body language of a God and the true thought process of an alien being, Pace turned, what I consider, an underutilized villain into a highlight of the film and one of my favorite performances of 2014 thus far. Slowly but surely, with Lincoln, The Hobbit trilogy and now this film, mark my words: Lee Pace will win an Academy Award one day. Guardians of the Galaxy is a feel good movie packed with a load of fun. While it could have worked on a few parts to truly make this ride the smoothest possible and the most even of surfaces, the ambitions here are gunning for way higher levels than any of us could have imagined. 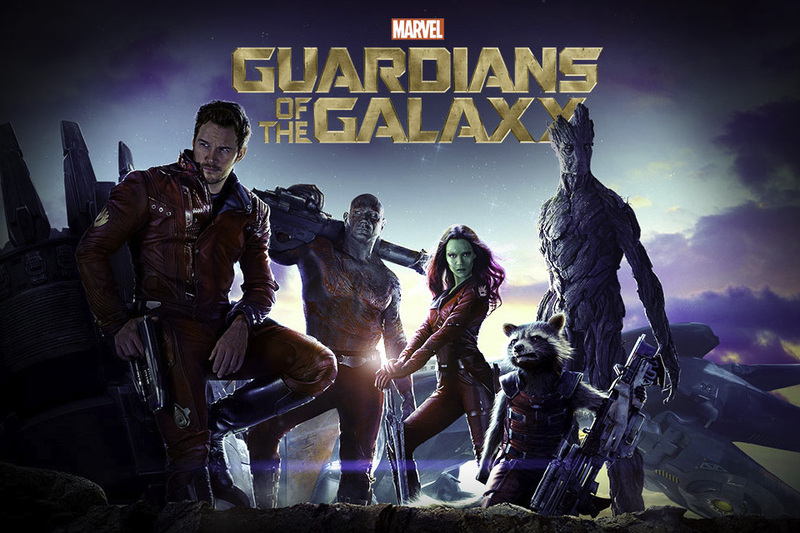 Perhaps with the upcoming sequel (we’ve been promised that the Guardians will return, and the recent news of a promised sequel are helping this claim), since we know the main characters now, the film can work on being as consistent as possible since it won’t have to go through so many backstories. This movie as a standalone, in the meantime, works for the majority of its duration. It’s got way more going on than expected, its comedy works most of the time, and everything from its cast to its visuals is as addicting as the pop tunes Star-Lord loves: You will leave hooked on a feeling.